Like many German public transport companies, Kaiserslautern has been looking for a way to connect the main railway station with the University of Kaiserslautern campus for several years. This route, which is heavily used during peak times, currently requires two buses, an articulated bus and a non-articulated bus. These are all used at the same time in order to transport students from the main railway station to the university. In the future, one Mercedes-Benz CapaCity bus would be enough to carry the same number of passengers. “Using the CapaCity as a shuttle using between the main railway station and the university provides us with maximum flexibility. We can use the vehicle on other routes during the holidays, at weekends or even between the peak daily times. With its own bus lane and equipped with a traffic-light priority system, this bus is in no way inferior to a track-bound vehicle in terms of speed, and costs consid-erably less”, said Wolfgang Herzog, Managing Director of Technische Werke Kaiserslautern Verkehrs-AG, praising the shuttle concept with the CapaCity. 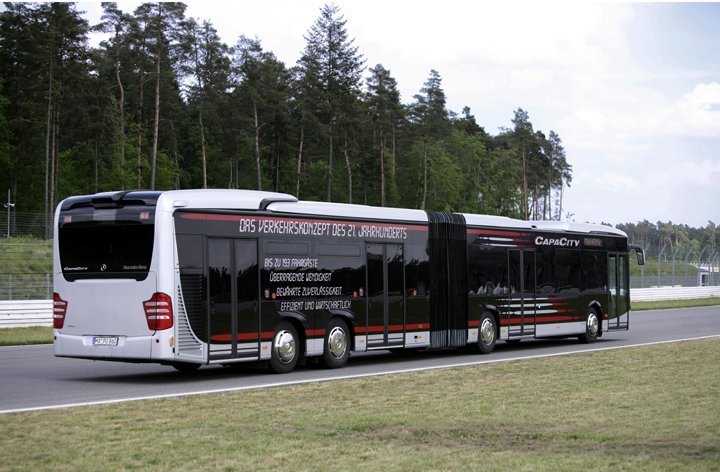 The CapaCity celebrated its world debut last year at the 2005 Mercedes-Benz Bus Days. The Mercedes-Benz Bus and Coach Unit was thus responding at an early stage to a trend which is becoming increasingly apparent on the European city bus market: local public transport operators are looking for new vehicle concepts to reduce fuel, driver, workshop and capital costs and to cope with extremely high passenger volumes in terms of passenger handling capacity. It is no accident that the Mercedes-Benz CapaCity meets the demands of the mar-ket. Those responsible for products at the Mercedes-Benz Bus and Coach Unit involved their customers in the development process as early as the planning stage. Using detailed customer surveys, they worked together to create a requirements profile for a new high-capacity bus. The CapaCity has all the features required, such as a considerable increase in capacity, good manoeuvrability and suitability for regular-service routes without the need for conversions or expansion of existing bus stops, as well as the typical economic efficiency and flexibility of a city bus. The use of volume production components from the Mercedes-Benz city bus modular system provides the required level of practicality. Despite being exactly 19.54 m in length, the Mercedes-Benz CapaCity negotiates its way through traffic just as easily as a conventional 18 m articulated bus thanks to four axles (two of which are steered) and a single articulated joint. The CapaCity's high level of agility is due to an electrohydraulically steered trailing axle. The 22.85 m turning circle of the CapaCity is exactly the same as for the 1.60 m shorter Citaro G three-axle articulated bus; the turning track is identical. In terms of vehicle length, the CapaCity is considerably easier to handle than other high-capacity designs with two articulated joints or trailers. As the Capa-City manages with just one articulated joint, manoeuvring is both simple and safe. The chassis, which has independent wheel suspension for the front axle as stan-dard and roll/pitch control available for special operating conditions or load ca-pacity utilisation, is both safe and comfortable. This system controls the characteristics of the shock absorbers depending on the driving situation and loading. This means increased safety when braking or during dynamic cornering through tauter damping. In other driving situations, softer damping increases comfort. This reduces and quickly overcomes any rolling, pitching or vertical movements of the body, which are particularly noticeable in an articulated bus. The high passenger handling capacity of the Mercedes-Benz CapaCity could be a major advantage in many respects. In the future, the same transport capacity can be achieved by using fewer buses. This significantly reduces acquisition, upkeep and labour costs. Additional costs for converting bus stops or road lanes are almost completely avoided with the CapaCity bus. With a low-floor design right through to the rear of the vehicle, the CapaCity features four double-width doors and step-free entrances and exits. The fourth axle and the corresponding increase of the maximum GVW to up to 32 tonnes permits considerably greater passenger capacity compared to conventional articulated buses. The seating design, which includes 37 fixed and five folding seats, increases the total capacity by around 40% to a maximum of 193 people. Almost all technical components, such as engines, transmissions and axles, come from the Mercedes-Benz low-floor modular system and are thus tried-and-tested standard production parts. This ensures low maintenance costs and fast service, even away from the home workshop. The CapaCity joins the Mercedes-Benz bus family with an unmistakable, unique design. Its exterior appearance is character-ised by its harmonious looks, which are deliberately reminiscent of modern trams. With its smooth-surfaced, clear lines, the whole vehicle has a dynamic, elegant and modern appearance.